Are you ready for another hilarious movie from your favorite comedian stars? Kevin Hart with the witty Tiffany Haddish will be having their first movie together called Night School. Kevin Hart plays a character of Teddy Walker who is forced to enroll in high school in order to get GED after he causes some issues in the company where he works. Haddish on the other hand also plays the role of Carrie, a serious night school teacher who gives Teddy Walker a hard time in his studies maybe because she noticed that Teddy is not really serious about going to school and prefers to go partying in the disco bar. There are surely plenty of humor and laughter when watching this movie. Furthermore, we get to see Taran Killam as the principal of the school who is really giving Walker some headache. Of course we all know that Kevin Hart will bring the movie beyond your expectation in comedy genre. 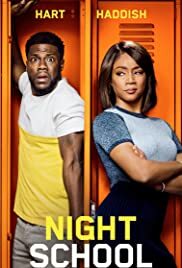 So if you are looking for hilarious movie this year that will make you laugh out loud, then Night School is the right one for you. Of course since this is rated R movie, be sure to watch the movie with people who are in appropriate age for viewing. There are plenty of lines and twists in the movie that will give you more time of fun which you want to watch all over again.